Why do prices vary so much with fine art reproduction companies? When you’re looking to commission an art reproduction of your favourite painting you’ll notice that American companies are generally a lot cheaper than European and UK art reproduction companies. There is a reason for this, and it’s called quality! Although most companies profess to paint museum-quality art reproductions, the standard really does vary. The majority of art reproduction companies get their art reproductions painted in China. When first starting Fabulous Masterpieces we diligently flew over to China to do extensive research. I personally spoke to alot of art studios and artists to find out about the quality of their art and the art reproduction industry. Looking at most of the paintings over there that were getting shipped out to the USA, the quality rangeded from poor to ok but never close to top-notch. It certainly wasn’t what I would term “museum quality“. The majority of artists over there told me that, generally, this kind of ‘high’ quality was fine for America but that the Europeans & Brits reject them as the quality just isn’t good enough. Hence why the majority of our artists are in Russia, predominantly in St. Petersburg. I’ll show you an example. As you can see there are major differences, but what do you expect if you’re only paying $150? You will notice that the colours are very bright in the replica and details are missing such as the leaves in his hair and the flowers on the mound that they are kneeling on. Her facial expression is also incorrect. Below is an original painting by Seurat and our reproduction oil painting by Fabulous Masterpieces plus a Museum Quality art reproduction by an American company for you to compare and contrast. 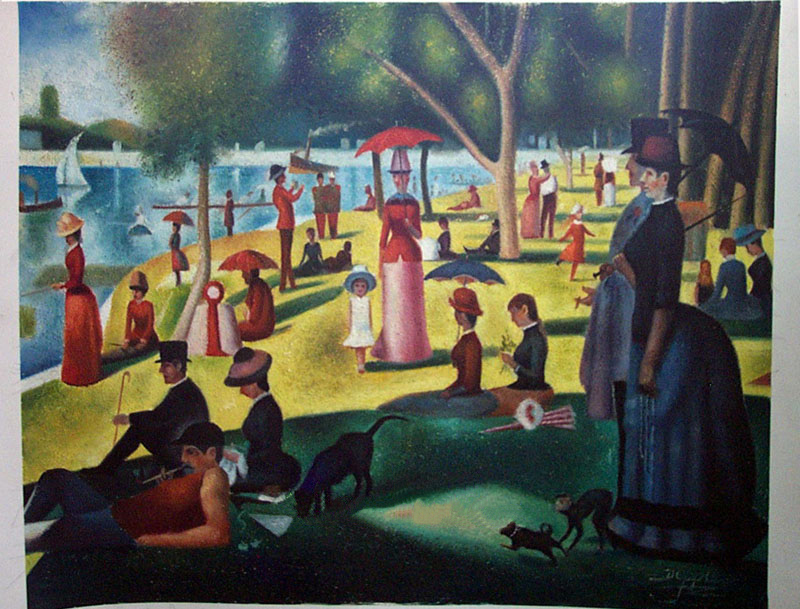 Seurat's Sunday Afternoon by an American Art Reproduction Company. You can see just by looking at these examples and comparing them with the original, what the differences in quality are. Hence, the differences in price. A lot of art reproduction companies version of “Museum quality” really does not live up to the term. Remember to always have a look at the examples of their replicas on their website to check out the quality. So the answer, in terms of price differences with art reproduction companies, is that as with most things in life you get what you pay for. If budget is more important to you than quality, then you’re in luck as you can buy art reproductions of your favourite painting from as little as $100. If quality, however is more important to you, then please buy your fine art replica with us as the quality of our paintings is what we pride ourselves on. We didn’t spend 2 years sourcing artists before starting Fabulous Masterpieces for nothing! We’d love to hear from you! If you would like to add something, or ask a question concerning art reproduction please leave a comment.